The royal sukkah adds royalty and dazzle to the holiday, With thick metal poles providing extra durability and a soaring height of 7.5′. 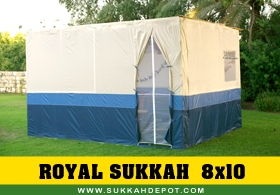 The royal sukkah is available in multiple sizes and is embellished with stunning fabric and unique color combinations, blue – light blue – white. In addition, the royal sukkah has large screened windows and features our exclusive 10 year warranty.